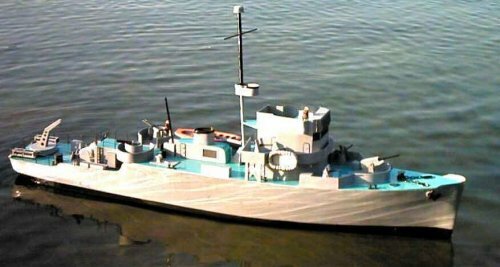 "Admirable" Class Minesweeper, 46 inch long. The following technique is derived mainly from trial-and-error over several years using polyester fiberglass resin. Polyester resin attacks styrofoam and styrene plastic, smells like acetone (nail polish remover) and is a carcinogen. I suggest ventilation and disposable rubber gloves. Epoxy resin would probably provide a better quality hull, does not smell, but is about four times as expensive as polyester resin. The choice is yours. 2 litre Motomaster Fiberglass Liquid Resin (includes hardener), $15 per litre, Canadian Tire. 1 square meter, Fiberglass Mat (random fibers), $5, Canadian Tire. 454 g, TREWAX Clear Paste Wax, $10, Home Hardware. Several cheap 1 inch to 2 inch paint brushes, 50 cents each, Dollar store. The mold and hull for a 46 inch minesweeper hull each cost about $25 + tax (polyester resin). The original hull should be stripped of rudder, propeller and shaft and as much superstructure as is possible. All parts of the remaining superstructure should be covered (protected from spattered resin). Prop shaft and rudder holes should be covered with masking tape. Wax the original fiberglass hull twice, as a mold release agent. Paste wax works well, car wax might work. If you are concerned with damaging the original hull, an aluminum foil barrier can be used to protect it. Strips of aluminum foil, about .75 inch wide, can be attached to the hull, slightly overlapping, using a very light coating of spray adhesive on the foil. The foil is then waxed. Remember, you have to remove this foil later without damaging your hull. Strip width depends on the curvature of the hull. If the hull shape is complex, as in a submarine, a split-mold (made in two pieces) ensures that the hull will be released from the mold easily and can be made as follows: cut two pieces of 1/8 inch plywood (doorskin) to conform to the shape of the keel. Use screws to hold the wooden pieces together, then make half the mold at a time. Polyester resin will start to gell and be unusable in the can about 15 minutes after being mixed with hardener, so use two people, prepare everything and work fast! Pouring the resin onto the mat will slow the cure a little. Mix only as much resin as you can use in 15 minutes! Mix some resin (150 ml) and a few drops of hardener thoroughly in a clean tin can. Paint the waxed hull with a coat of resin and leave to cure. Throw the brush away. The next layer is fiberglass mat (pre-cut to fit) and resin. Spread resin on the hull, place the mat on the wet hull then spread more resin through the mat. Tap the resin-soaked cloth with the tip of the brush all over, removing the air bubbles (this is very important). Don't be slow! Wooden ribs, located on the outside keep the mold rigid. Leave to cure overnight. Carefully peel the mold from the original hull. A thin metal ruler carefully slipped between the original hull and mold can help break the surface tension. Wax the inside of the mold twice (including the wood if a split-mold is used). Apply a coat of resin to the mold and let cure. Apply another coat of resin to the mold then put the pre-cut mat into the mold, saturate it with resin and tap the saturated cloth all over with the tip of the brush to remove bubbles (this is very important). Only apply enough resin to saturate the mat. If the hull is large, do it in two parts or use two people; brushes are cheap. Allow to cure overnight, then peel from the mold. Additional hulls can be made from the same mold for about $25 each. Wax the mold each time. N.B. Don't forget to wax the original hull and mold each time!! !